This Edsel release contains two albums of cover versions. 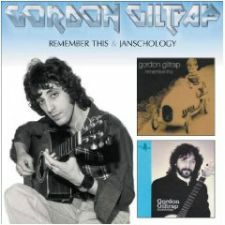 "Remember This" (2003) features Gordon's renditions of songs and melodies that influenced him in his youth, from three pieces by J.S. Bach, to Cliff Richard and The Shadows, to The Beatles and The Who. Rick Wakeman guests on two songs. Keyboards on "Down The River": Rick WakemanGordon Giltrap played everything else on all the other tracks. "Janschology" (2000) is an homage to another of Gordon's heroes, Bert Jansch, from its cover to its contents: Gordon plays five pieces written by or made famous by his friend Jansch, along with his self-penned tribute "Roots". The booklet contains annotation by Gordon himself, as well as many family photos and ephemera from his own archives.